With family budgets squeezed and the nation's GDP static or declining, the Huntingdonshire Manufacturer's Association (HMA) asked, where to next? First speaker Martin Keepfer (Regional Team Manager UKTI, East of England) pointed out that Government spending and reliance on British consumers were unlikely immediate sources in the current market. Exports, however, provide a viable solution. In the year to December 2011, there was an 18% increase in exports, to a value of £25bn. Furthermore, we in the East of England are one of the three regions that are the net earners for the UK. From there on Martin gave a good overview of the comprehensive assistance that UKTI can provide the novice and experienced exporters – for a summary of the funding available for various programs, see article “How to Make Britain a more successful exporter. Part A”. Nigel Smith of Tensor PCL then ratcheted up the pace a gear with his enthusiastic presentation on the underutilised R&D Tax credits. The news that the credit was equivalent to 225% for 2012 had the interest of the audience so fired up that it could well have been the cause of the fire alarm which interrupted Nigel's speech. Suitably refreshed by the break in the winter air, Nigel added some useful tips on ensuring good records of labour and of the ability to claim against subcontracted work. As a tax credit, the system was most suited for companies in profit. In fact, for Tensor the facility stimulated the company to free up its accumulated capital and actively pursue R&D, to develop new energy management systems as another product stream. We had barely caught our breath when Phil Spencer (International Trade Director South, HSBC) breezed into a talk at breakneck speed. Phil's view was robustly positive and pro-export. A tough EU environment was contrasted with an anticipated 73% increase in world trade growth by 2025. HSBC was finding its international side was extremely active, with 360 international managers and trade teams having doubled in number this year. Fact. If you are an exporting company you are SEVEN times more profitable than a domestic one. Even if the World economy is slowing down, there are still tremendous opportunities. One of Phil's striking personal observations was the readiness of other countries and nationalities to think globally in terms of international trade. Don't wait, be proactive and challenge your bank for regular support for international projects and aim for government assistance with projects of higher risk. Check out “HSBC EasyTrade – importing and exporting made easier”. Mike Ashmead (Encocam) returned us to a more measured pace as he provided a useful case-study of a successfully exporting business. The long term strategy was to build brand awareness for the seven different product areas. The result – increasing growth to 18% to 20% last year due to exports. We had been enthused, educated and received good advice. Now it was time to open our minds to a market usually ignored due to misconception – Russia. Tim Jelley of UKTI and Anthony Day of RBCC (Russo-British Business Club) pointed out that it was at present easier to sell to Russia than to the US or France. 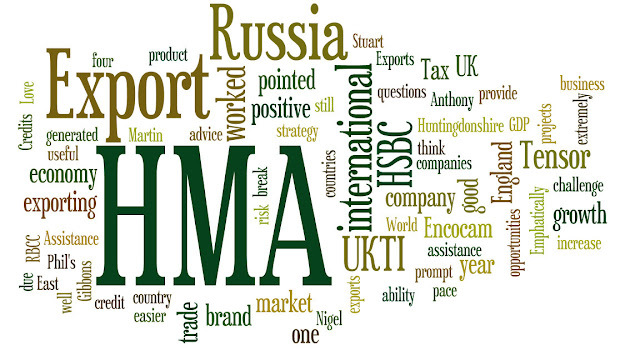 Contrary to historic prejudice, Tim's experience when he was in business with Russia was of prompt payment; Currently, the anti-bribery legislation in the UK is actually seen as a positive element by Russian partners; And Anthony pointed out that the UK brand was a highly desirable commodity in Russia. Russia is the closest of the emerging BRIC countries; has warm welcoming and very honourable people who enjoy an annual growth of 4% GDP and has large financial reserves. The country's future focus is modernisation and diversification of the economy. Of course problems still persist, with bureaucratic forms being one issue. However, this had not prevented major companies establishing a foothold in the country, e.g. Cadburys, BAT, Vodafone & BHS to name a few. Networking is extremely important in Russia and the RBCC has 2 offices in the country with 6000 contacts, so it is well worth getting in touch with them. The lively questions after the four hours of presentations and occasional break were moderated by Jan England, who hardly had to prompt for comments from both the floor and the speakers panel. Was China's economy really growing as fast as claimed? Should we not concentrate on building our domestic market before tackling international ones? These two questions alone generated a flurry of responses and counter views. In the end, Stuart Gibbons rounded off a positive event before being swept away to the buffet when hunger finally won out. UK and Scotland replay EU and UK?